The brain is one of the most intricate components of the human body. This vital organ has been studied, analyzed, and researched for centuries. Neuroscientists have come a long way in their findings regarding the brain`s structure, function, and capabilities. However, it is no surprise that the brain has so much more to offer neuroscientists than the information they have obtained to date. Through the use of brain mapping, neuroscientists will be able to obtain information about the brain never before thought possible. Brain mapping is a modern neurological technique involving the use of advanced imaging technologies. Mapping of the brain can lead to further findings of biological properties associated with specific disorders, illnesses, and additional elements that equip man with individuality. Knowledge of these findings could be key in identifying new treatment opportunities. The physicality of the brain can easily be examined and evaluated, but researchers can only acquire so much information through examining the brain`s structure. Remarkably, brain mapping allows researchers to view changes and activity within the brain when triggered in a given situation or presented with certain stimuli. The benefits of brain mapping are sufficient enough to revolutionize neuroscience, amplify neurological findings, and assist in the progress of new treatments. There has been controversy that the amount of funding and research necessary for brain mapping projects is impractical; in fear that the findings of these projects will be as minor as those discovered during the Human Genome Project. However, brain imaging techniques have advanced since the completion of the Human Genome Project. Researchers are confident that brain mapping will aid in new discoveries and revelations regarding the human brain. While advancing brain mapping will be expensive, researchers are confident that findings will lead to new treatments for diseases such as Parkinson`s or Alzheimer`s. Brain mapping is a neurological technique capable of examining the anatomy and function of the brain. Through the use of imaging, “electrical activity” of neurons can be detected in order to determine which parts of the brain are being utilized in given situations and responding to particular stimuli (“The Benefits of Brain Mapping” 253). Such a technique could be greatly beneficial in research regarding an organ so complex as the brain, the most complex sector of the human body. The intricate nature of the brain has deemed unfavorable for researchers. It will take a technique as revolutionary as imaging through brain mapping to further investigate the brain, its capabilities, functions, structures, and effects on the human body itself. If neuroscientists were interested in the basic, elemental aspects of the brain, they would have no need for a technique as sophisticated as brain mapping. However, neuroscientists have a larger plan in mind: to investigate human consciousness. Their intention is to discover what it is about the brain that provides us with our individuality, precisely how it makes us who we are (Friston 241-250). Furthermore, researchers hope to identify a neurological explanation as to why, how, and what contributes to psychiatric disorders in individuals. If neuroscientists are as successful as planned in their discoveries through their use of brain mapping, a whole new objective will commence. The more discoveries made regarding psychiatric disorders, psychological disorders, diseases, illnesses, etc., the more likely researchers will progress in producing effective treatments for these issues. The reason fully effective treatments have yet to be discovered is because we are unaware of everything there is to know about the issues at hand. As stated previously, brain mapping can detect which parts of the brain are being utilized in given situations and responding to particular stimuli. These detections could be what researchers have been lacking in the quest for a cure to disorders and illnesses involving the mind. Recent progress in brain mapping technology will lead to some of the most advanced understanding of brain function to date (Humphries). Analyzing and comprehending the source of these cognitive dilemmas could lead researchers to understand their causes. Not only could brain mapping result in the progress of effective treatments, but it could also lead researchers to discover ways to avoid particular disorders and illnesses before they even occur. Brain mapping may sound like a singular form of technology, however, many different technologies are associated with the brain mapping technique. Some of the most common brain mapping technologies include, magnetic resonance imaging (MRI), functional magnetic resonance imaging (fMRI), electroencephalography (EEG), positron emission tomography (PET) scan, and computed tomography (CT) scans. Each imaging tool provides its own fundamental purpose. Just the use of one of these technologies provides researchers with an immense amount of information. Imagine what could be discovered when multiple combinations of these technologies are being utilized in brain mapping research. MRIs are favored because they do not required exposure to radiation. The MRI provides detailed, three-dimensional images of brain structure at multiple angles. The fMRI functions similarly to the MRI, the only difference being the the fMRI provides a visual portrayal of brain activity. Electroencephalography measures electrical activity within the brain. The EEG is typically used to detect change occurring within the brain, comparing neural responses of the patient to the standard neural responses of healthy individuals (Baillet 14-30). PET scans also provide a visual portrayal of brain activity. However, PET scans require the patient to be injected with a form of glucose, and that glucose is used to detect the brain activity. Lastly, CT scans are an enhanced X-ray technique used to examine brain structure and can reveal brain damage. Clearly, each of these technologies could contribute greatly in brain imaging research. Each neurological assessment tool has advantages that could bring researchers closer to detecting and producing treatments for cognitive and fine motor deficits. Brain mapping is not an entirely new approach in the world of neuroscience. The infamous Human Genome Project utilized brain mapping within its research, as well as President Barack Obama`s recent BRAIN Initiative (Brain Research through Advancing Innovative Neurotechnologies). The primary goal of both research projects was to map genes, neurons, etc., within the brain in order to attain further research and understanding in the brain`s role in behavior and disease/disorder development. As previously mentioned, there has been controversy that the amount of funding and research necessary for brain mapping projects is impractical; in fear that the findings of these projects will be as minor as the those discovered during the Human Genome Project. The findings of the Human Genome Project are only “minor” in comparison to the findings researchers hoped to discover during the onset of the project. The Human Genome Project completed a “high-quality sequence” of almost the entire human genome, provided further information about brain structure, and location of specific genes (“Mapping the Brain-mapping Project” 786). Although these findings were not as substantial as researchers initially hoped for, they were still valuable pieces of information in the neuroscience field. Luckily, since the completion of the Human Genome Project, brain mapping technologies have only progressed. If researchers were able to make such paramount discoveries with the technology utilized during the Human Genome Project, imagine what vital information could be found through the advanced, modern brain mapping technologies used today. 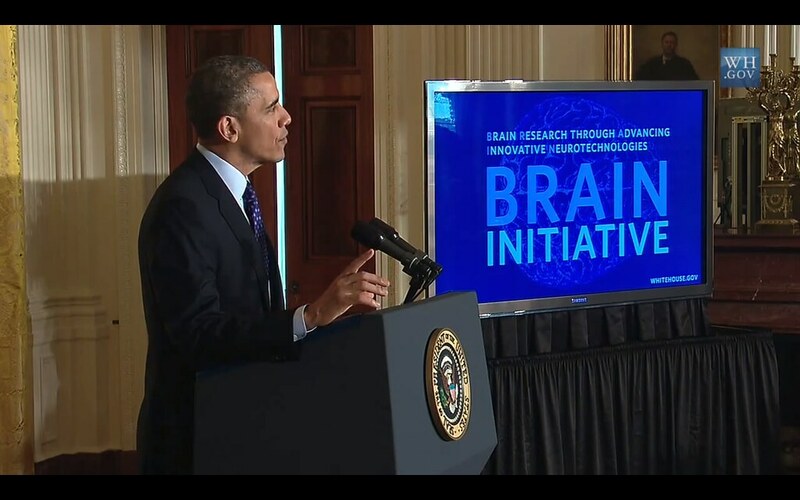 President Obama`s BRAIN Initiative is one of the most recent brain mapping research projects. Researchers of the recent project intend on using brain mapping to examine the interaction between “individual cells and complex neural circuits” (“Mapping the Brain-mapping Project” 786). Not only do researchers hope to determine the aspects and interconnections of the brain that are the source of disorders, but also find ways to prevent the disorders themselves. The utilization of brain mapping through neurological research projects such as these will bring researchers closer to discovering the cause of disorders relating to the brain; and further prompt the discovery of treatments and preventions of these disorders. The use of brain mapping in neurological research projects can also lead researchers to identify various treatment options for individuals with disorders such as Parkinson`s or Alzheimer`s. Approximately one million Americans are currently suffering from Parkinson`s disease, and five million from Alzheimer`s (“The Benefits of Brain Mapping” 253). At this moment, there is no cure for either disease. However, with the help of brain mapping, researchers hope the analyzing of individuals with Parkinson`s or Alzheimer`s will bring them a step closer to forms of prevention and/or treatment. The more information that can be obtained about these diseases, the more likely researchers will be able to generate a cure. If multiple patients with either disease were to be examined, the precise mapping of their brains could be analyzed and compared. Differences in the brains of these patients, compared to that of a “healthy” brain, could be a key in identifying a neurological source of the disease. If researchers were to make such revolutionary discoveries as these, brain mapping would be more than just a neurological research project tool; but a technical aid in ending suffering and even saving lives. Critics of brain mapping are basing their assumptions and opinions of the technique on the results of a research project from over a decade ago. Contrary to what these critics have claimed, the discoveries made during the Human Genome Project were not invaluable. That being said, brain mapping technologies since then have only advanced. Imaging techniques can provide some of the most detailed, accurate information of the brain, its structure, and the way in which it functions. Neurological, psychological, behavioral, and cognitive diseases and disorders are some of the most difficult to treat. Brain mapping will provide researchers with the opportunity to “dig deeper” into the neurological reasoning behind these brain-affiliated ailments, such as Parkinson`s and Alzheimer`s. Further research and understanding of these diseases and disorders could very well lead to the discovery of prevention and treatment as well. The amount of potential benefits to be gained through brain mapping research projects are too worthwhile not to pursue. Brain mapping can revolutionize the neuroscience field, as well as the medical field in the process. Friston, Karl J. "Modules and Brain Mapping." Cognitive Neuropsychology 1 June 2011: 241-250. Print.